This article is about the self-propelled weapon. For the pre-1900 naval meaning of "torpedo", see naval mine. For other uses, see Torpedo (disambiguation). Today's torpedoes can be divided into lightweight and heavyweight classes; and into straight-running, autonomous homers, and wire-guided. They can be launched from a variety of platforms. The word torpedo comes from a genus of electric rays in the order Torpediniformes, which in turn comes from the Latin "torpere" (to be stiff or numb). In naval usage, the American Robert Fulton introduced the name to refer to a towed gunpowder charge used by his French submarine Nautilus to demonstrate that it could sink warships. The concept of a torpedo existed many centuries before it was developed as a working device. The earliest description is found in the works of Syrian engineer Hassan al-Rammah in 1275. He described various kinds of incendiary arrows and lances, and illustrated what has been supposed to be a torpedo, which al-Rammah called "the egg which moves itself and burns", with the text suggesting that it was intended to move on the surface of water. In a 2011 episode of Mythbusters, Jamie Hyneman and Adam Savage constructed a replica of al-Rammah's torpedo and after several tries, discovered it was indeed a plausible weapon. Before the invention of the self-propelled torpedo the term was applied to any number of different types of explosive devices, generally having the property of being secret or hidden, including devices which today would include booby traps, land mines and naval mines. Although the term "torpedo" was not coined until 1800, the early submarine Turtle attacked using an explosive very similar in intent and function. Turtle dived under a British vessel to attach a bomb by means of an auger. The bomb was to be detonated by a timed fuse, probably a type of clockwork mechanism. In its only recorded attack, Turtle failed to attach its charge to the hull of HMS Eagle. The first usage of the term torpedo to refer to a naval explosive was by American inventor Robert Fulton. In 1800, Fulton launched his submarine, Nautilus, and demonstrated its method of attack using a floating explosive charge Fulton called a torpedo. The submarine would tow the torpedo, submerging beneath an enemy vessel and dragging the torpedo into contact with it. Fulton successfully destroyed demonstration targets in both France and Britain, but neither government was interested in purchasing the vessel and Fulton's experiments ceased in 1805. During the American Civil War, the term torpedo was used for what is today called a contact mine, floating on or below the water surface using an air-filled demijohn or similar flotation device. (As self-propelled torpedoes were developed the tethered variety became known as stationary torpedoes and later mines.) Several types of naval "torpedo" were developed and deployed, most often by the Confederates, who faced a severe disadvantage in more traditional warfare methods. In this period, "torpedoes" floated freely on the surface or were bottom-moored just below the surface. They were detonated when struck by a ship, or after a set time, but were unreliable. These could be as much a danger to Confederate as to Union shipping, and were sometimes marked with flags that could be removed if Union attack was deemed imminent. Rivers mined with Confederate torpedoes were often cleared by Unionists placing captured Confederate soldiers with knowledge of the torpedoes' location in small boats ahead of the main fleet. "Torpedoes" (mines) could also be detonated electrically by an operator on shore (as demonstrated also by Fulton), so friendly vessels or low-value enemy vessels could be ignored while waiting for the capital ships to sail over them. However, the Confederacy was plagued by a chronic shortage of materials including platinum and copper wire and acid for batteries, and the wires had a tendency to break. Electricity was a new technology, and the limitations of direct current for effective distance was poorly understood, so failures were also possible because of the decrease in voltage when the torpedoes were too far from the batteries. Former United States Navy Commander Matthew Maury, who served as a commander in the Confederate Navy, worked on the development of an underwater electrical mine. Union Navy Rear Admiral David Farragut encountered tethered and floating contact mines in 1864 at the American Civil War Battle of Mobile Bay. After his leading ironclad, USS Tecumseh, was sunk by a tethered contact mine (torpedo), his vessels halted, afraid of hitting additional torpedoes. Inspiring his men to push forward, Farragut famously ordered, as usually paraphrased, "Damn the torpedoes, full speed ahead!" The first torpedo designed to attack a specific target was the spar torpedo, an explosive device mounted at the end of a spar up to 30 feet (9.1 m) long projecting forward underwater from the bow of the attacking vessel. When driven up against the enemy and detonated, a hole would be caused below the water line. Spar torpedoes were employed by the Confederate submarine H. L. Hunley (and were successful in sinking the USS Housatonic), as well as by David-class torpedo boats, among others. However, these torpedoes were apt to cause as much harm to their users as to their targets. Illustration of naval torpedoes moored to the river bottom (the predecessors of modern naval mines). During the US Civil War, the term "torpedo" was also used to refer to various types of bombs and boobytraps. Confederate General Gabriel J. Rains deployed "sub-terra shells" or "land torpedoes", artillery shells with pressure fuses buried in the road by retreating Confederate forces to delay their pursuers. These were the forerunners of modern land mines. Union generals publicly deplored this conduct. Confederate secret agent John Maxwell used a clockwork mechanism to detonate a large "horological torpedo" (time bomb) on August 9, 1864. The bomb was hidden in a box marked "candles" and placed aboard a barge containing Union ammunition (20,000–30,000 artillery shells and 75,000 small arms rounds) moored at City Point, Virginia, on the James River. The explosion caused more than US$2 million in damage and killed at least 43 people. The coal torpedo was a bomb shaped like a lump of coal, to be hidden in coal piles used for fueling Union naval vessels. The bomb would be shoveled into the firebox along with the real coal, causing a Boiler explosion. Although the North referred to the device as the coal torpedo in newspaper articles, the Confederates referred to it as a "coal shell". Nordenfelt-class Ottoman submarine Abdülhamid (1886) was the first submarine in history to fire a torpedo while submerged. From the 1870s onwards, the word torpedo was increasingly used only to describe self-propelled projectiles that traveled under or on water. By the turn of the 20th century, the term no longer included mines and booby-traps as the navies of the world added submarines, torpedo boats and torpedo boat destroyers to their fleets. One of the torpedoes used by Abdülhamid and Abdulmecit. The first working prototype of the modern self-propelled torpedo was created by a commission placed by Giovanni Luppis (Croatian language: Ivan Lupis ), an Austrian naval officer from Fiume (now called Rijeka), a port city of the Austro-Hungarian Monarchy (modern Croatia), and Robert Whitehead, an English engineer who was the manager of a town factory. In 1864, Luppis presented Whitehead with the plans of the salvacoste (coastsaver), a floating weapon driven by ropes from the land, and made a contract with him in order to perfect the invention. Whitehead was unable to improve the machine substantially, since the clockwork motor, attached ropes, and surface attack mode all contributed to a slow and cumbersome weapon. However, he kept considering the problem after the contract had finished, and eventually developed a tubular device, designed to run underwater on its own, and powered by compressed air. The result was a submarine weapon, the Minenschiff (mine ship), the first self-propelled torpedo, officially presented to the Austrian Imperial Naval commission on December 21, 1866. Maintaining proper depth was a major problem in the early days but Whitehead introduced his "secret" in 1868 which overcame this. It was a mechanism consisting of a hydrostatic valve and pendulum that caused the torpedo's hydroplanes to be adjusted so as to maintain a preset depth. After the Austrian government decided to invest in the invention, Whitehead started the first torpedo factory in Fiume. In 1870, he improved the devices to travel up to approximately 1,000 yd (910 m) at a speed of up to 6 kn (11 km/h), and by 1881 the factory was exporting torpedoes to ten other countries. The torpedo was powered by compressed air and had an explosive charge of gun-cotton. Whitehead went on to develop more efficient devices, demonstrating torpedoes capable of 18 kn (33 km/h) in 1876, 24 kn (44 km/h) in 1886, and, finally, 30 kn (56 km/h) in 1890. Royal Navy representatives visited Fiume for a demonstration in late 1869, and in 1870 a batch of torpedoes was ordered. In 1871, the British Admiralty paid Whitehead £15,000 for certain of his developments and production started at the Royal Laboratories in Woolwich the following year. In 1893, RN torpedo production was transferred to the Royal Gun Factory. The British later established a Torpedo Experimental Establishment at HMS Vernon and a production facility at the Royal Naval Torpedo Factory, Greenock in 1910. These are now closed. Whitehead opened a new factory near Portland Harbour, England in 1890, which continued making torpedoes until the end of the Second World War. Because orders from the RN were not as large as expected, torpedoes were mostly exported. A series of devices was produced at Fiume, with diameters from 14 in (36 cm) upward. The largest Whitehead torpedo was 18 in (46 cm) in diameter and 19 ft (5.8 m) long, made of polished steel or phosphor-bronze, with a 200-pound (91 kg) gun-cotton warhead. It was propelled by a three-cylinder Brotherhood engine, using compressed air at around 1,300 psi (9.0 MPa) and driving two propellers, and was designed to self-regulate its course and depth as far as possible. By 1881, nearly 1500 torpedoes had been produced. Whitehead also opened a factory at St Tropez in 1890 which exported torpedoes to Brazil, Holland, Turkey and Greece. The United States Navy started using the Whitehead torpedo in 1892 after an American company, E.W. Bliss, secured manufacturing rights. Whitehead had faced competition from the American Lieutenant Commander John A. Howell, whose own design, driven by flywheel, was simpler and cheaper. It was produced from 1885 to 1895, and it ran straight, leaving no wake. A Torpedo Test Station had been set up in Rhode Island in 1870, and an automobile torpedo produced in 1871 was unsuccessful. The Lay torpedoes were also largely unsuccessful as were various privately invented types. The Howell torpedo was the only USN model until Whitehead torpedoes produced by Bliss and Williams (later E. W. Bliss Company) entered service in 1894. Five varieties were produced, all 18 in (46 cm) diameter. An improved version, the Bliss-Leavitt, with a turbine engine was later produced, some with a larger diameter. Various versions were used in both World War I and World War II. Whitehead purchased rights to the gyroscope of Ludwig Obry in 1888 but it was not sufficiently accurate, so in 1890 he purchased a better design (ironically from Howell) to improve control of his designs, which came to be called the "Devil's Device". The firm of L. Schwartzkopff in Germany also produced torpedoes and exported them to Russia, Japan and Spain. In 1885, Britain ordered a batch of 50 as torpedo production at home and at Fiume could not meet demand. On 16 January 1878, the Turkish steamer Intibah became the first vessel to be sunk by self-propelled torpedoes, launched from torpedo boats operating from the tender Velikiy Knyaz Konstantin under the command of Stepan Osipovich Makarov during the Russo-Turkish War of 1877-78. 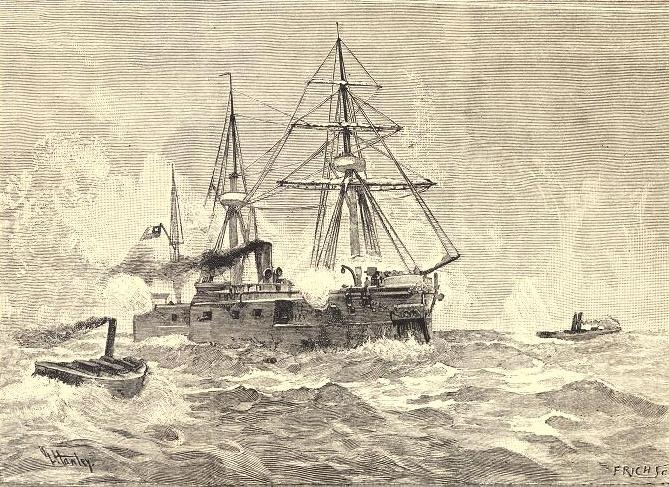 In another early use of the torpedo, Chilean frigate Blanco Encalada was sunk on April 23, 1891 by a torpedo from the gunboat Almirante Lynch, during the 1891 Chilean Civil War. The Chinese turret ship Dingyuan was purportedly hit and disabled by a torpedo after numerous attacks by Japanese torpedo boats during the First Sino-Japanese War in 1894. At this time torpedo attacks were still very close range and very dangerous to the attackers. By this time the torpedo boat, the first of which had been built at the shipyards of Sir John Thornycroft in 1877, had gained recognition for its effectiveness, and the first torpedo boat destroyers (later simply destroyers) were built to counter it. Torpedoes were also used to equip gunboats of around 1,000 tons, these becoming torpedo gunboats. Originally, torpedoes were designed to be straight running, though this was not always the case in practice. Around 1897, Nikola Tesla patented a remote controlled boat and later demonstrated the feasibility of radio-guided torpedoes to the United States military. Several western sources reported that the Qing dynasty Imperial Chinese military under the direction of Li Hongzhang acquired "Electric torpedoes", which were deployed in numerous waterways along with fortresses and numerous other modern military weapons acquired by China. At the Tientsin Arsenal in 1876, the Chinese developed the capacity to manufacture these "electric torpedoes" on their own. A form of Chinese art, the Nianhua, depict such torpedoes being used against Russian ships during the Boxer Rebellion, whether they were actually used in battle against them was undocumented and unknown. The Russo-Japanese War (1904–1905) was the first great war of the 20th century. It was the first practical and mass deployment of man's newly built steel battleships, cruisers, fledgling destroyers and submarines, and the torpedo boat. During the course of the war the Imperial Russian and Imperial Japanese navies would launch nearly 300 torpedoes at each other, all of them of the "self propelled automotive" type. The deployment of these new underwater weapons resulted in only 1 battleship, but 2 armored cruisers and 2 destroyers being sunk in action; with the remainder of the 80 some odd warships being sunk by the more conventional methods of gunfire, mines, and scuttling. On 27 May 1905, during the battle of Tsushima, Admiral Rozhestvensky's flagship, the battleship Knyaz Suvorov, had been gunned to a wreck by Admiral Togo's 12 inch gunned battleline. With the Russians sunk and scattering, Togo prepared for pursuit, and while doing so ordered his torpedo boat destroyers (TBDs) (mostly referred to as just destroyers in most written accounts) to finish off the Russian battleship. The Knyaz Suvorov was set upon by 17 torpedo firing warships, 10 of which were TBDs and 4 torpedo boats. 21 torpedoes were launched at the pre-dreadnought, and 3 struck home, one fired from the destroyer Murasame and two from torpedo boats #72 and #75. The flagship slipped under the waves shortly thereafter, taking over 900 men with her to the bottom. In 1915, Admiral Bradley A. Fiske imagined an aerial torpedo attack would be carried out close to the water and at night. The end of the war fuelled new theories, and the idea of dropping lightweight torpedoes from aircraft was conceived in the early 1910s by Bradley A. Fiske, an officer in the United States Navy. Awarded a patent in 1912,  Fiske worked out the mechanics of carrying and releasing the aerial torpedo from a bomber, and defined tactics that included a night-time approach so that the target ship would be less able to defend itself. Fiske determined that the notional torpedo bomber should descend rapidly in a sharp spiral to evade enemy guns, then when about 10 to 20 feet (3 to 6 m) above the water the aircraft would straighten its flight long enough to line up with the torpedo's intended path. The aircraft would release the torpedo at a distance of 1,500 to 2,000 yards (1,400 to 1,800 m) from the target. Fiske reported in 1915 that, using this method, enemy fleets could be attacked within their own harbors if there were enough room for the torpedo track. The first recorded launch of a self-propelled torpedo in battle by a submarine was on Dec. 9, 1912 during the Balkan Wars. The Greek submarine Delfin (ΔΕΛΦΙΝ) launched a torpedo against the Turkish cruiser “Mezdiye”. According to the archives, the attack was unsuccessful. Torpedoes were widely used in the First World War, both against shipping and against submarines. Germany and its allies disrupted the supply lines to Britain largely by use of submarine torpedoes (though submarines also extensively used guns). Britain and its allies also used torpedoes throughout the war. U-boats themselves were often targeted, twenty being sunk by torpedo. Two Royal Italian Navy torpedo boats scored a success against an Austrian-Hungarian squadron, sinking the battleship Szent István with two torpedoes. Initially the Japanese Navy purchased Whitehead or Schwartzkopf torpedoes but by 1917 they were conducting experiments with pure oxygen instead of compressed air. Because of explosions they abandoned the experiments but resumed them in 1926 and by 1933 had a working torpedo. They also used conventional wet-heater torpedoes. In the inter-war years, tight budgets caused nearly all navies to skimp on testing their torpedoes. As a result, only the Japanese had fully tested torpedoes (in particular the Type 93, nicknamed Long Lance postwar by historian Samuel E. Morison) at the start of World War II. The lack of reliability caused major problems for the American Submarine Force in the early years of the American involvement in World War II, primarily in the Pacific Theater. All classes of ship, including submarines, and aircraft were armed with torpedoes. [Clarification needed] Naval strategy at the time was to use torpedoes, launched from submarines or warships, against enemy warships in a fleet action on the high seas. Targeting unarmed enemy merchant shipping was prohibited by rules of war. (In the event, merchantmen were armed and acted as de facto naval auxiliaries, rendering the distinction irrelevant.) There was concern torpedoes would be ineffective against warships' heavy armor; an answer to this was to detonate torpedoes underneath a ship, badly damaging its keel and the other structural members in the hull, commonly called "breaking its back". This was demonstrated by magnetic influence mines in World War I. The torpedo would be set to run at a depth just beneath the ship, relying on a magnetic exploder to activate at the appropriate time. The Naval Torpedo Station in Alexandria, Virginia was one of three United States Navy factories to manufacture torpedoes during World War II. Germany, Britain and the U.S. independently devised ways to do this; German and American torpedoes, however, suffered problems with their depth-keeping mechanisms, coupled with faults in magnetic pistols shared by all designs. Inadequate testing had failed to reveal the effect of the Earth's magnetic field on ships and exploder mechanisms, which resulted in premature detonation. The Kriegsmarine and Royal Navy promptly identified and eliminated the problems. In the United States Navy, there was an extended wrangle over the problems plaguing the Mark 14 torpedo (and its Mark 6 exploder). Cursory trials had allowed bad designs to enter service. Both the Navy Bureau of Ordnance and the United States Congress were too busy protecting their own interests to correct the errors, and fully functioning torpedoes only became available to the USN 21 months into the Pacific War. British submarines used torpedoes to interdict the Axis supply shipping to North Africa, while Fleet Air Arm Swordfish sank three Italian battleships at Taranto by torpedo and (after a mistaken, but abortive, attack on Sheffield) scored one crucial hit in the hunt for the German battleship Bismarck. Large tonnages of merchant shipping were sunk by submarines with torpedoes in both the Battle of the Atlantic and the Pacific War. Torpedo boats, such as MTBs, PT boats, or S-boats, enabled relatively small but fast craft to carry enough firepower, in theory, to destroy a larger ship, though this rarely occurred in practice. The largest warship sunk by torpedoes from small craft in WW2 was the British cruiser Manchester, sunk by Italian MAS boats on the night of 12/13 August 1942 during Operation Pedestal. Destroyers of all navies were also armed with torpedoes to attack larger ships. In the Battle off Samar, destroyer torpedoes from the escorts of American task force "Taffy 3" showed effectiveness at defeating armor. Damage and confusion caused by torpedo attacks were instrumental in beating back a superior Japanese force of battleships and cruisers. In the Battle of the North Cape in December 1943, torpedo hits from British destroyers Savage and Saumarez slowed German battlecruiser Scharnhorst enough British battleship Duke of York to catch and sink her, and in May 1945 the British 26th Destroyer Flotilla (coincidentally led by Saumarez again) ambushed and sank Japanese heavy cruiser Haguro. Because of improved submarine strength and speed, torpedoes had to be given improved warheads and better motors. During the Cold War torpedoes were an important asset with the advent of nuclear-powered submarines, which did not have to surface often, particularly those carrying strategic nuclear missiles. During the Korean War the United States Navy successfully attacked a dam with air-launched torpedoes. Israeli Navy units attacked the technical research ship USS Liberty with gunfire and torpedoes during the 1967 Six Day War, resulting in the loss of 46 crew. The British Royal Navy nuclear attack submarine HMS Conqueror sank the Argentine Navy light cruiser ARA General Belgrano during the Falklands War with the loss of 323 lives. The Croatian Navy crippled the Yugoslav patrol boat PČ-176 Mukos with a torpedo launched from an improvised device during the battle of the Dalmatian channels in November 1991. In 2010 the South Korean Navy ship ROKS Cheonan was sunk with the loss of 46 personnel. Subsequent investigation concluded that the warship had been sunk by a North Korean torpedo fired by a midget submarine. 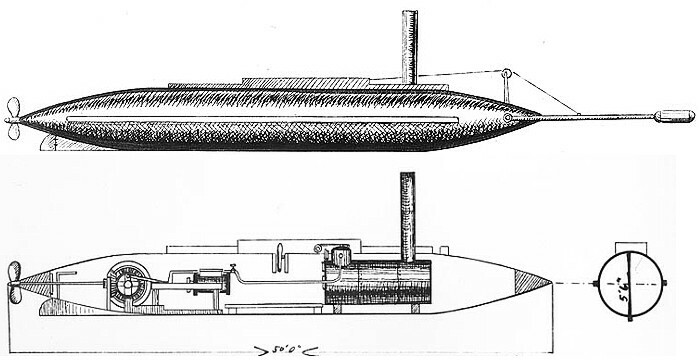 The Whitehead torpedo of 1866, the first successful self-propelled torpedoes, used compressed air as its energy source. The air was stored at pressures of up to 2.55 MPa (370 psi) and fed to a piston engine which turned a single propeller at about 100 rpm. It was able to travel about 180 metres (200 yd) at an average speed of 6.5 knots (12.0 km/h). The speed and range of later models was improved by increasing the pressure of the stored air. In 1906 Whitehead built torpedoes which could cover nearly 1,000 metres (1,100 yd) at an average speed of 35 knots (65 km/h). At higher pressures the cooling experienced by the air as it expanded in the engine caused icing problems (see adiabatic cooling). This drawback was remedied by heating the air with seawater before it was fed to the engine, which increased engine performance further, because the air expanded even more after heating. This was the principle used by the Brotherhood engine. This led to the idea of injecting a liquid fuel, like kerosene, into the air and igniting it. In this manner the air is heated up more and expands even further, and the burned propellant adds more gas to drive the engine. Construction of such heated torpedoes started circa 1904 by Whitehead's company. A further improvement was the use of water to cool the combustion chamber of the fuel-burning torpedo. This not only solved heating problems so more fuel could be burnt but also allowed additional power to be generated by feeding the resulting steam into the engine together with the combustion products. Torpedoes with such a propulsion system became known as wet heaters, while heated torpedoes without steam generation were retrospectively called dry heaters. A simpler system was introduced by the British Royal Gun factory in 1908. Most torpedoes used in World War I and World War II were wet-heaters. The amount of fuel that can be burnt by a torpedo engine (i.e. wet engine) is limited by the amount of oxygen it can carry. Since compressed air contains only about 21% oxygen, engineers in Japan developed the Type 93 (nicknamed Long Lance postwar) for destroyers and cruisers in the 1930s. It used pure compressed oxygen instead of compressed air and had performance unmatched by any contemporary torpedo in service, through the end of World War II. However, oxygen systems posed a serious danger to any ship that came under attack while still carrying such torpedoes; Japan lost several cruisers partly due to catastrophic secondary explosions of Type 93s. During the war, Germany experimented with hydrogen peroxide for the same purpose. The Brennan torpedo had two wires wound around internal drums. Shore-based steam winches pulled the wires, which spun the drums and drove the propellers. An operator controlled the relative speeds of the winches, providing guidance. Such systems were used for coastal defence of the British homeland and colonies from 1887 to 1903 and were purchased by, and under the control of, the Army as opposed to the Navy. Speed was about 25 knots (46 km/h) for over 2,400 m.
The Howell torpedo used by the US Navy in the late 19th century featured a heavy flywheel which had to be spun up before launch. It was able to travel about 400 yards (370 m) at 25 knots (46 km/h). The Howell had the advantage of not leaving a trail of bubbles behind it, unlike compressed air torpedoes. This gave the target vessel less chance to detect and evade the torpedo, and avoided giving away the attacker's position. Additionally, it ran at a constant depth, unlike Whitehead models. Electric propulsion systems avoided tell-tale bubbles. John Ericsson invented an electrically propelled torpedo in 1873; it was powered by a cable from an external power source, as batteries of the time had insufficient capacity. The Sims-Edison torpedo was similarly powered. The Nordfelt torpedo was also electrically powered and was steered by impulses down a trailing wire. Germany introduced its first battery-powered torpedo shortly before World War II, the G7e. It was slower and had shorter range than the conventional G7a, but was wakeless and much cheaper. Its lead-acid rechargeable battery was sensitive to shock, required frequent maintenance before use, and required preheating for best performance. The experimental G7ep, an enhancement of the G7e, used primary cells. The United States had an electric design, the Mark 18, largely copied from the German torpedo (although with improved batteries), as well as FIDO, an air-dropped acoustic homing torpedo for anti-submarine use. Modern electric torpedoes such as the Mark 24 Tigerfish or DM2 series commonly use silver oxide batteries which need no maintenance, allowing torpedoes to be stored for years without losing performance. A number of experimental rocket-propelled torpedoes were tried soon after Whitehead's invention but they were not successful. Rocket propulsion has been implemented successfully by the Soviet Union for example in the VA-111 Shkval, and has been recently revived in Russian and German torpedoes as it is especially suitable for supercavitating devices. Modern torpedoes utilize a variety of drive mechanisms, including gas turbines (the British Spearfish), monopropellants, and sulphur hexafluoride gas sprayed over a block of solid lithium. The first of Whitehead's torpedoes had a single propeller and needed a large vane to stop it turning in a circle. Not long afterward the idea of contra-rotating propellers was introduced (at Woolwich), to avoid the need for the vane. The three-bladed propeller came in 1893 and the four-bladed one in 1897. To minimise noise, today's torpedoes often use pump-jets. Some torpedoes, such as the Russian VA-111 Shkval, the Iranian Hoot and the German Unterwasserlaufkörper/ Barracuda, use supercavitation to increase their speed to over 200 knots (370 km/h); the maximum speed of torpedoes which do not use supercavitation, such as the American Mark 48 and British Spearfish, is well under 100 kn (120 mph; 190 km/h), although figures are not always supplied. Torpedoes may be aimed at the target and fired unguided, similarly to an artillery shell, or they may be guided onto the target. They may be guided automatically towards the direction in which the target is detected by some procedure, e.g. sound it produces (homing), or by the operator, typically via commands sent over a signal-carrying cable (wire guidance). The Victorian era Brennan could be steered onto its target by varying the relative speeds of its propulsion cables. However, the Brennan required a substantial infrastructure and was not suitable for shipboard use. Therefore, for the first part of its history, the torpedo was guided only in the sense that its course could be regulated so as to achieve an intended impact depth (because of the sine wave running path of the Whitehead, this was a hit or miss proposition, even when everything worked correctly) and, through gyroscopes, a straight course. With such torpedoes the method of attack in small torpedo boats, torpedo bombers and small submarines was to steer a predictable collision course abeam to the target and release the torpedo at the last minute, then peeling away, all the time subject to defensive fire. In larger ships and submarines, fire control calculators gave a wider engagement envelope. Originally, plotting tables (in large ships), combined with specialised slide rules (known in U.S. service as the "banjo" and "Is/Was"), reconciled the speed, distance, and course of a target with the firing ship's speed and course, together with the performance of its torpedoes, to provide a firing solution. By the Second World War, all sides had developed automatic electro-mechanical calculators, exemplified by the U.S. Navy's Torpedo Data Computer. Submarine commanders were still expected to be able to calculate a firing solution by hand as a backup against mechanical failure, and because many submarines existing at the start of the war were not equipped with a TDC; most could keep the "picture" in their heads and do much of the calculations (simple trigonometry) mentally, from extensive training. Against high value targets and multiple targets, submarines would launch a spread of torpedoes, to increase the probability of success. Similarly, squadrons of torpedo boats and torpedo bombers would attack together creating a "fan" of torpedoes across the target's course. Faced with such an attack, the prudent thing for a target to do was to turn so as to parallel the course of the incoming torpedo and steam away from the torpedoes and the firer, allowing the relatively short range torpedoes to use up their fuel. An alternative was to "comb the tracks", turning to parallel the incoming torpedo's course, but turning towards the torpedoes. The intention of such a tactic was still to minimise the size of target offered to the torpedoes, but at the same time be able to aggressively engage the firer. This was the tactic advocated by critics of Jellicoe's actions at Jutland, his caution at turning away from the torpedoes being seen as the reason the Germans escaped. The use of multiple torpedoes to engage single targets depletes torpedo supplies and greatly reduces a submarine's combat endurance. Endurance can be improved by ensuring a target can be effectively engaged by a single torpedo, which gave rise to the guided torpedo. Though Lupis' original design had been rope guided, torpedoes were not wire-guided until the 1960s. During the First World War the U.S. Navy evaluated a radio controlled torpedo launched from a surface ship called the Hammond Torpedo. A later version tested in the 1930s was claimed to have an effective range of 6 miles. Modern torpedoes use an umbilical wire, which nowadays allows the computer processing power of the submarine or ship to be used. Torpedoes such as the U.S. Mark 48 can operate in a variety of modes, increasing tactical flexibility. Homing "fire and forget" torpedoes can use passive or active guidance, or a combination of both. Passive acoustic torpedoes home in on emissions from a target. Active acoustic torpedoes home in on the reflection of a signal, or "ping", from the torpedo or its parent vehicle; this has the disadvantage of giving away the presence of the torpedo. In semi-active mode, a torpedo can be fired to the last known position or calculated position of a target, which is then acoustically illuminated ("pinged") once the torpedo is within attack range. Later in the Second World War torpedoes were given acoustic (homing) guidance systems, originally by the Germans in the G7es torpedo. Pattern-following and wake homing torpedoes were also developed. Acoustic homing formed the basis for torpedo guidance after the Second World War. The homing systems for torpedoes are generally acoustic, though there have been other target sensor types used. A ship's acoustic signature is not the only emission a torpedo can home in on: to engage U.S. supercarriers, the Soviet Union developed the 53-65 wake-homing torpedo. The warhead is generally some form of aluminised explosive, because the sustained explosive pulse produced by the powdered aluminium is particularly destructive against underwater targets. Torpex was popular until the 1950s, but has been superseded by PBX compositions. Nuclear warheads for torpedoes have also been developed, e.g. the Mark 45 torpedo. In lightweight antisubmarine torpedoes designed to penetrate submarine hulls, a shaped charge can be used. Detonation can be triggered by direct contact with the target or by a proximity fuze incorporating sonar and/or magnetic sensors. Control surfaces are essential for a torpedo to maintain its course and depth. A homing torpedo also needs to be able to outmanoeuvre a target. Good hydrodynamics are needed for it to attain high speed efficiently and also to give long range, since the torpedo has limited stored energy. Torpedoes may be launched from submarines, surface ships, helicopters and fixed-wing aircraft, unmanned naval mines and naval fortresses. They are also used in conjunction with other weapons; for example the Mark 46 torpedo used by the United States becomes the warhead section of the ASROC (Anti-Submarine ROCket) and the CAPTOR mine (CAPsulated TORpedo) is a submerged sensor platform which releases a torpedo when a hostile contact is detected. Originally, Whitehead torpedoes were intended for launch underwater and the firm was upset when they found out the British were launching them above water, as they considered their torpedoes too delicate for this. However, the torpedoes survived. The launch tubes could be fitted in a ship's bow, which weakened it for ramming, or on the broadside; this introduced problems because of water flow twisting the torpedo, so guide rails and sleeves were used to prevent it. The torpedoes were originally ejected from the tubes by compressed air but later slow burning gunpowder was used. Torpedo boats originally used a frame that dropped the torpedo into the sea. Royal Navy Coastal Motor Boats of World War I used a rear-facing trough and a cordite ram to push the torpedoes into the water tail-first; they then had to move rapidly out of the way to avoid being hit by their own torpedo. Developed in the run up to the First World War, multiple-tube mounts (initially twin, later triple and in WW2 up to quintuple in some ships) for 21 to 24 in (53 to 61 cm) torpedoes in rotating turntable mounts appeared. Destroyers could be found with two or three of these mounts with between five and twelve tubes in total. The Japanese went one better, covering their tube mounts with splinter protection and adding reloading gear (both unlike any other navy in the world), making them true turrets and increasing the broadside without adding tubes and top hamper (as the quadruple and quintuple mounts did). Considering their Type 93s very effective weapons, the IJN equipped their cruisers with torpedoes. The Germans also equipped their capital ships with torpedoes. Smaller vessels such as PT boats carried their torpedoes in fixed deck mounted tubes using compressed air. These were either aligned to fire forward or at an offset angle from the centerline. Later, lightweight mounts for 12.75 in (32.4 cm) homing torpedoes were developed for anti-submarine use consisting of triple launch tubes used on the decks of ships. These were the 1960 Mk 32 torpedo launcher in the USA and part of STWS (Shipborne Torpedo Weapon System) in the UK. Later a below-decks launcher was used by the RN. This basic launch system continues to be used today with improved torpedoes and fire control systems. Modern submarines use either swim out systems or a pulse of water to discharge the torpedo from the tube, both of which have the advantage of being significantly quieter than previous systems, helping avoid detection of the firing from passive sonar. Earlier designs used a pulse of compressed air or a hydraulic ram. Originally, torpedo tubes were fitted to both the bow and stern of submarines. Modern submarine bows are usually occupied by a large sonar array, necessitating midships tubes angled outward, while stern tubes have largely disappeared. The first French and Russian submarines carried their torpedoes externally in Drzewiecki drop collars. These were cheaper than tubes, but less reliable. Both Britain and America experimented with external tubes in World War II. External tubes offered a cheap and easy way of increasing torpedo capacity without radical redesign, something neither had time or resources to do prior to, or early in, the war. British T class submarines carried up to 13 torpedo tubes, up to 5 of them external. America's use was mainly limited to earlier Porpoise-, Salmon-, and Sargo-class boats. Until the appearance of the Tambors, most American submarines only carried 4 bow and either 2 or 4 stern tubes, something many American submarine officers felt provided inadequate firepower. This problem was compounded by the notorious unreliability of the Mark 14 torpedo. Late in World War II, the U.S. adopted a 16 in (41 cm) homing torpedo (known as "Cutie") for use against escorts. It was basically a modified Mark 24 Mine with wooden rails to allow firing from a 21 in (53 cm) torpedo tube. Aerial torpedoes may be carried by fixed-wing aircraft, helicopters or missiles. They are launched from the first two at prescribed speeds and altitudes, dropped from bomb-bays or underwing hardpoints. Although lightweight torpedoes are fairly easily handled, the transport and handling of heavyweight ones is difficult, especially in the small space of a submarine. After the Second World War, some Type XXI submarines were obtained from Germany by the United States and Britain. One of the main novel developments seen was a mechanical handling system for torpedoes. Such systems were widely adopted as a result of this discovery. From a torpedo tube mounted either in a trainable deck mount (common in destroyers), or fixed above or below the waterline of a surface vessel (as in cruisers, battleships, and armed merchant cruisers) or submarine. Early submarines, and some torpedo boats (such as the U.S. World War II PT boats, which used the Mark 13 aircraft torpedo) used deck-mounted "drop collars", which simply relied on gravity. From shackles aboard low-flying aircraft or helicopters. As the final stage of a compound rocket or ramjet powered munition (sometimes called an assisted torpedo). A light torpedo used primarily as a close attack weapon, particularly by aircraft. A heavy torpedo used primarily as a standoff weapon, particularly by submerged submarines. In the case of deck or tube launched torpedoes, the diameter of the torpedo is obviously a key factor in determining the suitability of a particular torpedo to a tube or launcher, similar to the caliber of the gun. The size is not quite as critical as for a gun, but diameter has become the most common way of classifying torpedoes. Length, weight, and other factors also contribute to compatibility. In the case of aircraft launched torpedoes, the key factors are weight, provision of suitable attachment points, and launch speed. Assisted torpedoes are the most recent development in torpedo design, and are normally engineered as an integrated package. Versions for aircraft and assisted launching have sometimes been based on deck or tube launched versions, and there has been at least one case of a submarine torpedo tube being designed to fire an aircraft torpedo. As in all munition design, there is a compromise between standardisation, which simplifies manufacture and logistics, and specialisation, which may make the weapon significantly more effective. Small improvements in either logistics or effectiveness can translate into enormous operational advantages. Mark 30 torpedo on display at DCAE Cosford. MU90 Impact triple launcher onboard F221 Hessen, a Sachsen class frigate of the German Navy. It was reported on 20 May 2013 that the Russian Navy did not have enough torpedoes for training or testing purposes. An unnamed source in the Navy said that "Our manufacturers make obsolete torpedoes that were developed back in the 1980s and we don't even have enough of them for testing when building or refitting ships and submarines. The torpedoes that we have in storage are out of their service lives and can't be used." He added that the problem is that torpedo development is out of step with the type and number of warships that Russia is now building, he added. It is expected that the Navy will only start getting modern fifth-generation torpedoes in 2017. The Fizik-1 or "product 2534" was ready five years ago but has still not been cleared for service while the next version, the Fizik-2, has already appeared. Wikimedia Commons has media related to Torpedoes. This article incorporates text from Overland monthly and Out West magazine, by Bret Harte, a publication from 1886 now in the public domain in the United States. ↑ Partington, James Riddick (1999). "A History of Greek Fire and Gunpowder". Johns Hopkins University Press. p. 203. ISBN 0-8018-5954-9. http://books.google.com/?id=30IJLnwpc8EC. ↑ "Artifact Spotlight: Whitehead torpedo". http://navalunderseamuseum.org/media/6c06204b6731dd48ffff8336ffffe906.pdf. Retrieved December 18, 2012. ↑ John King Fairbank (1980). Late Ch'ing, 1800-1911 Volume 11, Part 2 of The Cambridge History of China Series, Denis Crispin Twitchett. Cambridge University Press. p. 249. ISBN 0-521-22029-7. http://books.google.com/books?id=pEfWaxPhdnIC&pg=PA249&dq=electric+torpedoes+chinese&hl=en&ei=eg1gTZ3iI4SClAeurfDrCw&sa=X&oi=book_result&ct=result&resnum=5&ved=0CDcQ6AEwBDgK#v=onepage&q=electric%20torpedoes%20chinese&f=false. Retrieved February 19, 2011. ↑ Jane E. Elliott (2002). Some did it for civilisation, some did it for their country: a revised view of the boxer war. Chinese University Press. p. 204. ISBN 962-996-066-4. http://books.google.com/books?id=wWvl9O4Gn1UC&pg=PA204&dq=dong+fuxiang+torpedoes&hl=en&ei=IBZgTafKB4Kdlge3h_DxCw&sa=X&oi=book_result&ct=result&resnum=1&ved=0CCcQ6AEwAA#v=onepage&q=dong%20fuxiang%20torpedoes&f=false. Retrieved 2010-06-28. ↑ Hart, Albert Bushnell. Harper's pictorial library of the world war, Volume 4. Harper, 1920, p. 335. ↑ The New York Times, July 23, 1915. "Torpedo Boat That Flies. Admiral Fiske Invents a Craft to Attack Fleets in Harbors" Retrieved on September 29, 2009. ↑ The war's top ace used them exclusively, and stuck religiously to the "cruiser rules"
↑ 22.0 22.1 Morison, Samuel Eliot. History of United States Naval Operations in World War II: Breaking the Bismarcks Barrier (New York, 1950), p.195. ↑ Google Books listing of p.195. ↑ Faltum, Andrew (1996). The Essex Aircraft Carriers. Baltimore, Maryland: The Nautical & Aviation Publishing Company of America. pp. 125–126. ISBN 1-877853-26-7. ↑ Fitzsimons, Bernard, ed. "Bliss-Leavitt", in The Illustrated Encyclopedia of 20th Century Weapons and Warfare (London: Phoebus, 1978), Volume 4, p.386. ↑ Beach, Edward L., Jr., Captain, USN (rtd). Run Silent, Run Deep. ↑ The British called theirs the "fruit machine". ↑ Beach describes it well in Run Silent, Run Deep. ↑ The Attack Submarine suggests shorter patrols actually improve effectiveness. ↑ "TO TEST HAMMOND TORPEDO; General Wood Named as Head of Board to Pass Judgment on Invention". The New York Times. 29 August 1916. http://query.nytimes.com/gst/abstract.html?res=FA0F14F7355B17738DDDA00A94D0405B868DF1D3. ↑ "WW2 Memories - World War 2 - Second World War - Dartmouth Museum: Dartmouth Harbour was defended by Torpedo Tubes". Dartmouth Museum. http://dartmouthmuseum.org/collections/memories/ww2.html. Retrieved 2 April 2012. "Never fired in anger, a fixed torpedo tube battery was built on the east of the harbour mouth, just up river from Kingswear Castle. The intent was to defend the river Dart." ↑ Fitzsimons, Bernard, ed. Illustrated Encyclopedia of Weapons and Warfare (London: Phoebus, 1978), Volume 10, p.1040, "Fubuki"; Preston, Antony. Destroyers. ↑ Blair, Clay, Jr. Silent Victory (Lippencott, 1975); Lockwood, Charles A., Admiral. Hellcats of the Sea. Boyne, Walter J. Clash of Titans. Simon and Schuster; 1995. ISBN 0-684-80196-5. Brown, David. Warship Losses of World War Two. Arms and Armour, London, 1990. ISBN 0-85368-802-8. Crowley, R.O. "Confederate Torpedo Service". The Century, Volume 56, Issue 2, The Century Company, New York, June 1898. Lyon, David. The First Destroyers. Chatham Publishing, 1 & 2 Faulkner's Alley, Cowcross St. London, Great Britain, 1996. ISBN 1-55750-271-4. Milford, Frederick J. "U.S. Navy Torpedoes: Part Two—The Great Torpedo Scandal, 1941-43". The Submarine Review, October 1996. Morison, Samuel Eliot. History of United States Naval Operations in World War Two. Volume 3. Little, Brown, and Company, 1984 edition. Olender, Piotr. Russo-Japanese Naval War 1904-1905, Vol. 2, Battle of Tsushima. Published by Stratus s.c.; Sandomierz, Poland, 2010. ISBN 978-83-61421-02-3. Perry, Milton F. Infernal Machines: The Story of Confederate Submarine and Mine Warfare. Baton Rouge: Louisiana State University Press, 1985. ISBN 0-8071-1285-2. "Modern Torpedoes And Countermeasures", by Austin Joseph, Bharat Rakshak Monitor, Volume 3(4) January–February 2001. "A History of the Torpedo The Early Days"